The enchanting Jade Luise Ewen – singer, song-writer and actress – wears a KATRIN LANGER “Art Nouveau”- clutch at the “Ant Man Premiere” in London July 2015. 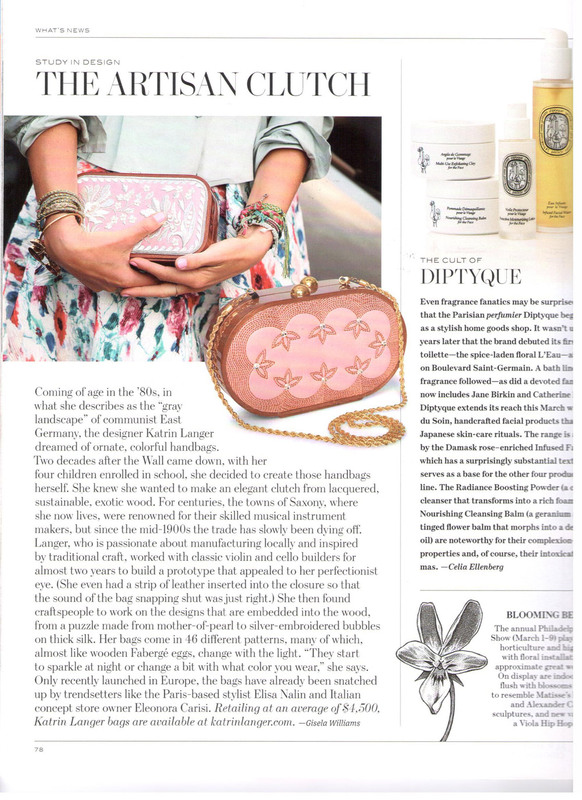 Our floral brocade embroidered square bag (article no. 91737-03) in the April issue of FLAIR 2015! The Topmodel Franziska Knuppe wears a KATRIN LANGER clutch of the new Spring Summer 2015 collection during the Goldene Kamera Awards – with gently shimmering flowers in mint green! 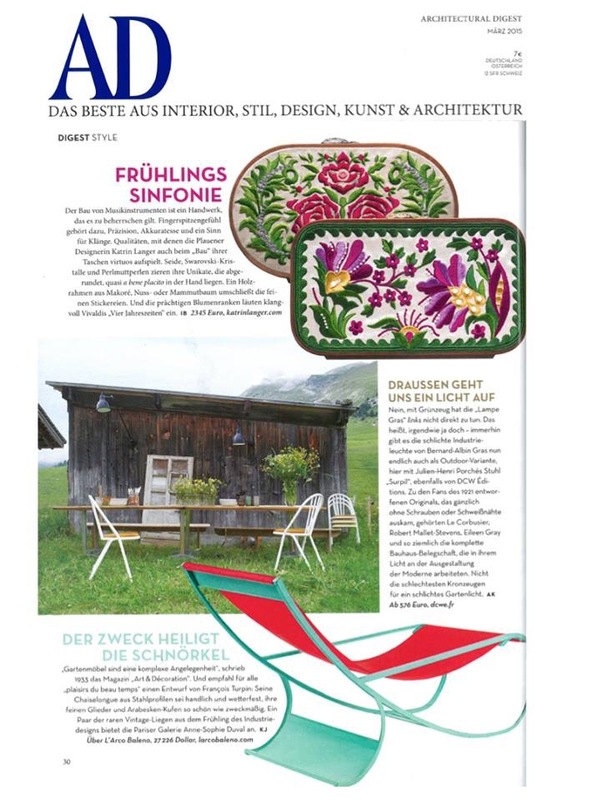 All about design & art – The Swiss magazine “WOHNREVUE” featured the ice blue KATRIN LANGER clutch with sophisticated floral embroidery! Franziska Knuppe during the “Maybelline New York” Event in Berlin with a KATRIN LANGER clutch. LONDON Calling – Explore our new collection on-site at MODA MEWS! Jella Haase wearing a KATRIN LANGER clutch at BAMBI Award Gala in Berlin! WE HEART! Actress Jella Haase wears a KATRIN LANGER clutch at premiere of “Die Mannschaft” in Berlin 11/2014. Judith Rakers – The art of perfecting on the red carpet at the German Film Award 2014 with KATRIN LANGER clutch mother of pearl collection. Judith Rakers Moderatorin wore the KATRIN LANGER clutch with mother-of-pearl inlays at the German Award Gala “Deutscher Fernsehpreis 2014”. It’s thrilling! BUNTE Exclusiv writes: KATRIN LANGER is the rising star! WOW!! We can’t believe it! We are still so flattered by yesterday’s evening. KATRIN LANGER won the NEW FACES AWARD FASHION in the category “Best Accessoires Label”. The stunning German actress Anna Maria Muehe at the BERLINALE Opening Night with a KATRIN LANGER clutch! Thank you so much, VOGUE Deutschland! KATRIN LANGER at Paris Fashion Week – on Vogue Germany! Eleonora Carisi and her KATRIN LANGER clutch with Anna dello Russo and Candela Novembre – right on Anna dello Russo! Elisa Nalin and her embroidered KATRIN LANGER clutch on L`Officiel!